An Example of Scholarly Restraint? individual during his earthly ministry 2,000 years ago because he is saving himself for his Bride, the church. There was one curious thing about this fragment making news today: what major Christian holiday is coming up? It’s not Christmas or Easter. Monday did mark Rosh Hashanah for the Jews, but stories like this don’t usually coincide with Jewish holidays. 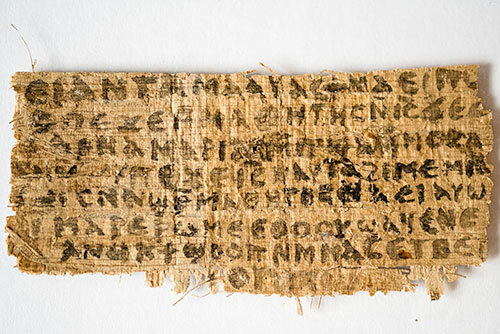 The timing may be evidence that this fragment is genuine. Don’t get me wrong–I don’t think the apparent assertion of the fragment reflects the truth of the matter. But a serious scholar presented it to a conference of peers, submitting it for peer review, besides the fact that it is not being publicized in conjunction with any major Christian holiday. Now, to be clear, this discovery isn’t PaleoBabble — at least not yet. Karen King is a good scholar. She teaches on the history of early Christianity (which would include Gnostic sects) at Harvard. I don’t believe for a minute she’s faking anything. Does anyone know exactly what the fragment says? Yes, they do. You can read the full text in the first couple of paragraphs in the New York Times article to which Heiser links from his blog PaleoBabble.